a.k.a – the easy, pain-free solution to finding your winning outfit. This e-book is the result of a blog post I started authoring several months ago about men’s suits. It began as a simple ‘how to…’ tutorial but quickly spiralled out of control, and eventually became something far more substantial. 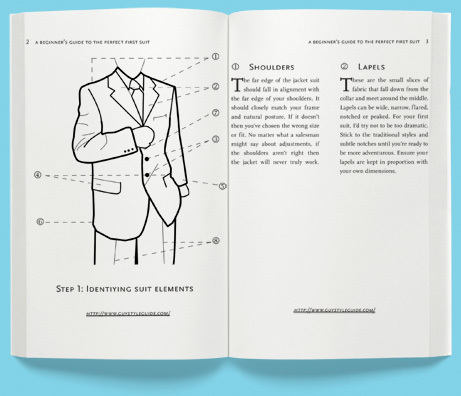 The 20-page manual contains everything you need to know about purchasing your first suit, and it’s freely available to download either directly from the website as a PDF, or viewable online at scribd.com. Although the content of the guide is copyrighted, I’m happy to let you share the file as long as you don’t alter it in any way. As ever, I’m happy to hear all feedback and, if the interest is great enough, I may expand and/or update the guide at a later date. Enjoy the read and good luck finding that perfect outfit.